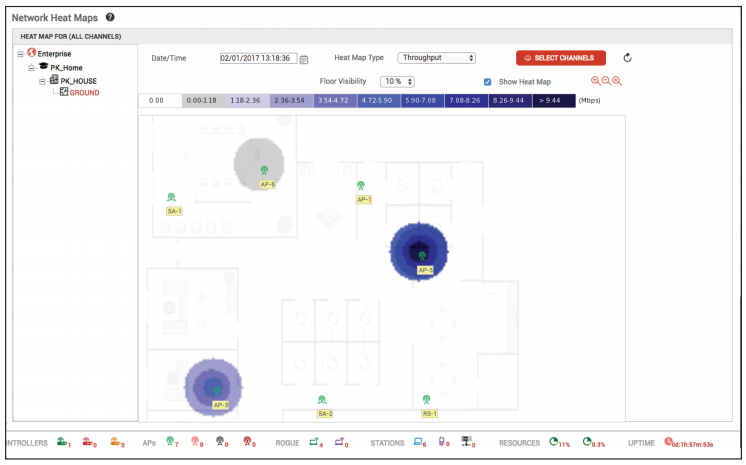 Comprehensive real-time and historical WLAN performance trends dashboards including RF metrics for a centralized view. Real-time and historical RF visualization enables remote management and saves on-site truck-roll expenses. Current and historical wireless station metrics enable rapid resolution of issues by rewinding and recreating past state. Customized dashboards for mobile devices allow anytime, anywhere management of WLAN network. Integrated Rogue AP detection enhances enterprise security. Extensive wireless reports support network audits and enterprise reporting requirements. Alarms and events with customizable notifications facilitate proactive wireless network monitoring and troubleshooting. Enterprise scalability allows management of up to 15,000 APs. 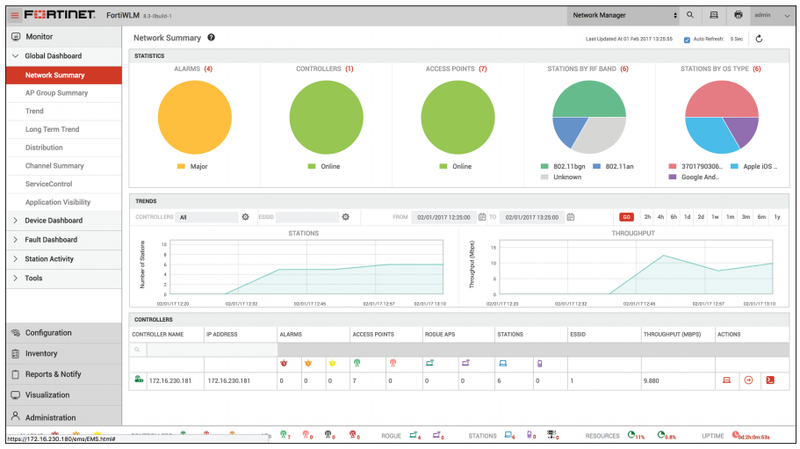 The Network Manager enables users to easily provision and manage multiple Fortinet controllers from a single web interface. One of the primary functionalities of the Network Manager is the ability to create a global controller configuration and push it to one or more managed controllers. If a global controller configuration is changed in the Network Manager, all controllers using it are automatically updated with those changes. To enhance security, the global controller configurations are owned by the Network Manager and cannot be altered by the controllers using them. Inventory view in the Network Management platform provides users with a streamlined view to look at all the provisioned controllers. Administrators can also directly add controllers from the Inventory, to be managed by the Network Management Platform. Spectrum Manager is a software application that detects and classifies sources of wireless interference to ensure optimal spectrum usage and high service levels. By keeping you informed about Wi-Fi interference, Spectrum Manager lets you take action to alleviate problems by removing, adjusting for, or working around the sources of interference. You can proactively manage channel interference issues, avoiding problems before they occur. Graphical dashboard displays and reports provide actionable intelligence on the health of your wireless spectrum, giving you deep insight into both current and historical data. Spectrum Manager gathers interference data from a network of dedicated sensors. It can also gather data from the APs which can dedicate one of its three radios to act as a sensor. The software creates detailed logs on a broad range of wireless interference sources. The information captured includes the type of interferer, signal strength, impacted channels, start/end time, and duration. Spectrum Manager is fully integrated with Service Assurance Manager, correlating data to let you quickly determine if any connectivity failures are caused by interference. Fortinet’s Service Assurance Manager is the industry’s only predictive diagnostic software for remotely diagnosing the health of wireless networks without requiring overlay sensors. With Service Assurance Manager, the network automatically performs predictive health checks and reports any issues before end users are impacted. Service Assurance Manager creates network baselines and runs application-level tests continuously or on demand. It provides you with an executive summary of network operations through a simple dashboard. Unlike conventional wireless technology, Fortinet’s single-channel architecture enables wireless access points within the network to communicate with each other. This allows a Virtual Client to temporarily be placed on the access point, emulating a client station for the duration of Service Assurance Manager’s diagnostic tests. Virtual Clients test for application performance from the client to the application server, without impacting users on the network. This approach enables Service Assurance Manager to proactively detect service failures that ordinary management software cannot — for example, if an antenna has fallen off an access point. Many network issues require more detailed visibility. That used to require setting up an onsite test network, running diagnostic and performance tests, and analysing results on a variety of wireless security profiles. Service Assurance Manager uses the Virtual Client to automate these tasks remotely, providing visibility into network operations without the need to send IT staff and equipment onsite. Fortinet Wireless Manager includes a signature-based Wireless Intrusion Prevention System able to detect and counter wireless security issues. Network administrators can customize the response to threats based on an organization’s individual needs, as well as define new signatures and generate reports of all activity that affects security. Download the Fortinet FortiWLM Datasheet (PDF). FortiWLM-100D, FortiWLM-1000D and FWM-VM 50 AP Software License. Includes network management, spectrum analysis, service assurance management and WIPS Features. FortiWLM-100D, FortiWLM-1000D and FWM-VM 250 AP Software License. Includes network management, spectrum analysis, service assurance management and WIPS Features. FortiWLM-100D, FortiWLM-1000D and FWM-VM 2500 AP Software License. Includes network management, spectrum analysis, service assurance management and WIPS Features.